The Big Green dropped an 83-80 heartbreaker to Cornell on Friday night, but it recovered with arguably its best performance of the season in an 82-66 blowout of Columbia. Currently, the team stands at 11-11 overall and 2-4 in Ivy League play, tying it for fifth place in the conference with Brown University and the University of Pennsylvania. Eager to bounce back from three consecutive losses, the Big Green brought a sense of urgency for most of the first half against Cornell. Dartmouth led for the majority of the half, building up a six-point lead with about seven minutes remaining in the half. However, Cornell’s Matt Morgan took charge late in the first half, sinking three consecutive triples to give the Big Red a 40-34 lead. Morgan finished the night with an eye-popping 41 points, including a four-point play and a several other big shots that affected the game’s momentum. He made nine of his 11 3-pointers and set a Leede Arena record for highest point total in a single game. Dartmouth never led in the second half, but it fought hard the entire half and nearly erased an eight-point deficit with seven minutes remaining. Chris Knight ’21 stood out with a season-high 27 points, and five Dartmouth players scored in double figures. But despite the individual accomplishments, no one on the team was satisfied with Friday night’s outcome. The loss marked Dartmouth’s second Ivy League loss by one possession and its third Ivy League loss by five points or fewer. However, while each of those three losses was gut-wrenching, McLaughlin made sure to emphasize just how different the team’s position in the conference would be if only a few key plays had gone differently. It’s not always easy to turn the page after such a difficult loss, but the Big Green turned the page and wrote a perfect next chapter against Columbia. 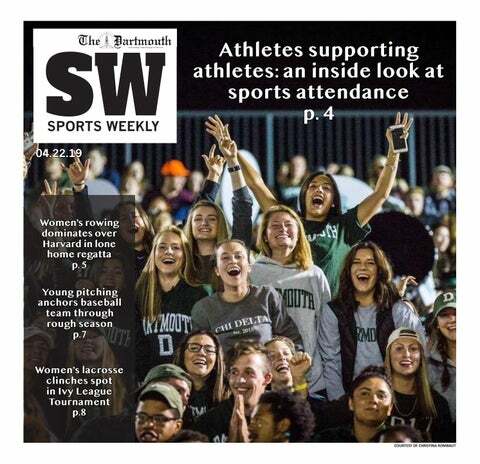 Dartmouth won the Saturday night game 82-66 and led by as much as 31 points in arguably its best performance of the season. Brendan Barry ’20 led the team with 21 points, including eight points in a span of 1:41 midway through the first half to give the Big Green a double-digit lead it would never relinquish. James Foye ’20 added 14 points while Knight, Ian Carter ’20 and Ian Sistare ’20 all hit double digits. In its two losses to Brown and Yale University last weekend, Dartmouth only made nine combined 3s and shot 24 percent from the field in those two losses. On Saturday, it started off cold from long range, missing its first seven 3s. However, Barry and company heated up quickly, making 10 of their last 17 3s to ignite a stellar overall offensive effort. Barry’s dominant stretch gave the Big Green its comfortable lead, but Foye and Sistare both had game-changing shots as well. Foye hit a buzzer-beater right before halftime to increase Dartmouth’s lead to 14, and Sistare opened the second half with back-to-back 3s to essentially put the game out of reach. Those critical shots sent Leede Arena into a frenzy, giving the Big Green a home-court advantage it didn’t always have in its prior home games. Unfortunately for the Big Green, it now only has two home games remaining on the season. Its next four games will be on the road, as it travels south to face Penn and Princeton University next weekend before traveling to face Brown and Yale the following weekend. The Penn and Princeton doubleheader will be especially difficult, as Dartmouth will be facing the past two Ivy League champions on back-to-back nights and will have to endure some long, tiring bus rides in order to do so. While Dartmouth is tied for fifth in the conference, it is just two games back from fourth place. The top four teams in the conference will make the Ivy League tournament, whose winner earns an automatic bid to the NCAA tournament. Since Dartmouth is currently tied with Penn and two games back of Princeton, these next two games are all the more important. Overcoming a two-game deficit with so many road games ahead is a tall task. But it’s important to remember that the Big Green could easily be 5-1 in the Ivy League had a few plays gone slightly differently, and the team has proven to be competitive throughout conference play. Armed with those facts, McLaughlin is certainly optimistic for the upcoming road trip. “We’re leaving on Thursday to get two wins,” he said.